Cumberland County College is on the front lines of advanced manufacturing, training the chronically unemployed in production, quality and safety so they can get good paying jobs in South Jersey’s food and glass industries. Over the past two years, lead instructor Gerald Bose has trained more than 80 people, young and old, who were all anxious to find work. The 150 hours of instruction ends in a test, which, if passed, gets students certified as Production Technicians. A government grant pays for their books and tuition. 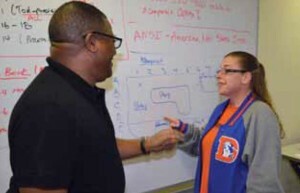 Cumberland County College instructor Gerald Bose reviews a math problem with student Allisen Cox-Boldley. Bose said 70 percent of students who have passed this test after taking the Cumberland classes have found work over the past two years. One such student is Jamil Gillespie of Laurel Lake, NJ, who said he is determined to take every class, pass the test and get a good job. He needs the money to support his family, which includes 2-year-old Timothy and one on the way. has improved his people skills, too. A number of area manufacturers have hired students from the Cumberland manufacturing classes. They include Durand Glass Manufacturing Co., Clement Pappas & Co., Gerresheimer Glass Inc. and Omni Baking Company. Over the past two years, advanced manufacturing classes have been held at county colleges in Camden, Middlesex, Passaic and Bergen. Many of these were underwritten with grants from the NJ Department of Labor & Workforce Development. The current Cumberland class is underwritten with a federal grant. From the point of view of manufacturers, these training classes are essential. As many as 600,000 US manufacturing jobs have gone wanting in recent years because there’s such a big gap between the job requirements and the skills of those applying. This story was originally published in the January 2014 issue of New Jersey Business, the magazine of the New Jersey Business & Industry Association. The author is Christopher Biddle, President of Biddle Communications & Public Relations.